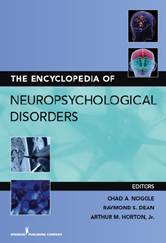 This book serves as an A-Z reference that addresses the neuropsychological aspects of 300 neurological, neuropsychiatric, and neuromedical disorders. Each entry follows a 5 section structure that will cover (1) essential features of the disorder (2) physiological basis of the disorder (3) neuropsychological and other clinical presentation (4) assessment and diagnostic practices (5) evidence-based treatments and interventions. This book is written for clinical professionals and students in training to aid in clinical awareness, diagnostic accuracy, and intervention successfulness.The text goes beyond the emotional and behavioral aspects of each disorder and views the broader impacts of the symptoms. This approach emphasizes the importance of looking at the other functional impacts of these manifestations (e.g. cognitive deficits secondary to depression, orthodopaedic ambulation issues). The emphasis on neuropsychological sequelae, physiological basis, and means of diagnosing and treating of 300 conditions across the lifespan make this the most comprehensive resource available to professionals in and around neuropsychology, neuropsychiatry and the behavioral neurosciences.